Green Tea and Velociraptors | Your bite or mine? 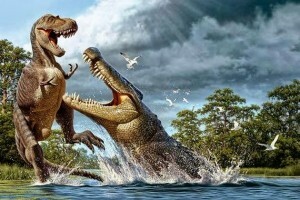 EGU Blogs » Network » Green Tea and Velociraptors » Your bite or mine? It rises from the dark waters like some behemoth from the deep, and lets out a blood-curdling roar. It’s feeding time. One of the most iconic scenes from Jurassic Park III is where the long-snouted, sail-backed giant theropod dinosaur Spinosaurus emerges from underwater to try, yet again, to eat our beleaguered rabble of misfortunates. 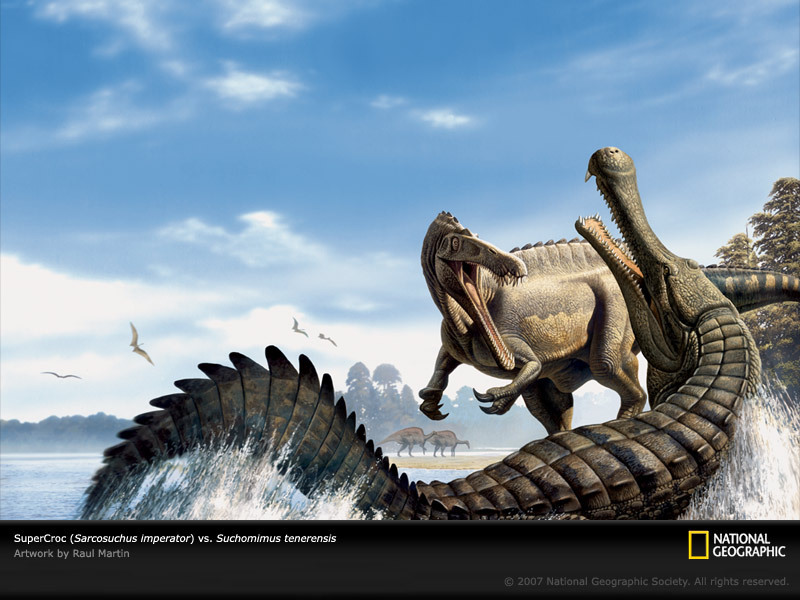 It’s always been the way these dinosaurs have been portrayed, including one of Spinosaurus’ close cousins Baryonyx from the UK. With their long snouts, bulbous tips, and pointy teeth, it’s often been thought that spinosaurid dinosaurs were quite a lot like modern crocodiles. But how much of this is true? Down at the palaeo labs at Bristol University in the UK, they’ve become a bit of a whizz at a field called biomechanics – using digital reconstructions from modern technology like CT-scanning (what they use to peer inside your head in hospitals) to work out how animals moved, even from just their bones. By using biomechanics, you can work out things like, oh let’s just say, if crocodiles and spinosaurid dinosaurs fed in the same manner! Well, that’s exactly what Andrew Cuff, a PhD student in Bristol at the time, set out to test. Cuff used CT-scanning on a range of modern crocodiles to get lovely 3D images of their skulls, and used the same techniques on a group of spinosaurid fossils. This provided the raw data to compare the two, but how do you actually go about testing how similar they are mechanically, to figure out if they had similar feeding styles? Enter the engineering wizardry of beam mechanics. Essentially, this treats each of the snouts of the specimens as a beam. You can treat it mathematically then by applying different loads, or pressures and assess how different parts of the ‘beam’ respond, in terms of compression, tension, bending and other mechanicsy terms. These in turn tell you about the kind of forces the skeleton was able to resist, and provide clues about feeding styles. One of the most striking results is that size matters (sorry lads) – this had a great effect on the results, and therefore the inferred function of the snouts. In the crocs, the alligator has the best snout for resisting forces of bending and torsion, and is probably capable of handling much bigger prey than, for example, the gharial which had a longer and more slender snout, ideal for hooking fish and gliding stealthily through the water. This is probably to do with the alligator’s infamous ‘death roll’, where it grabs its prey and spins them round in a bewildering display of ancient savagery to essentially, break an animal into smaller more manageable chunks (note: the death roll does not work on exam revision or house chores). Both Baryonyx and Spinosaurus have relatively stronger snouts than any of their crocodilian cousins, based pretty much on their larger size. However, they probably didn’t perform similar death rolls, and may instead have shaken their poor victims from side to side like a ragdoll. One can only imagine the horror of a 5 tonne, bipedal crocodile ambushing you underwater before proceeding to thrash around wildly as bits of your limbs began to fall off. But nature isn’t very nice, is it..
Are crocodiles secret fruit lovers? Co-evolution, the greatest show on Earth?